Well So much for diving everyday this holiday! The 2 or 3 weeks running up to the holidays were epic, the pressure was on at work and had a hard time balancing the two. So i tried to dive only every second day ..... I usually land up pretty useless after diving for a couple hours. Alas! Redemption is near and we are going straight from the berg.. ok one nite sleep over .. and we are off to Mozam for 10days! P.S - There is good news from up at Cape Vidal, they have sunk the second Barge. It is a little shallow and the top is in 15m. However the sand is at 20-30m so it could be a real great Cuta spot. The guys have reported some good catches from the other deeper barge already, including Tuna and Sailfish. Lets just hope that the 'Parkies' dont go and make it a sanctuary. Well the whole of Natal obviously thought that the only place to dive was the North Coast. You cant blame them the conditions have been great here and every one wants a piece of paradise. I decided not to go too early but rather wait for everyone to get in first and then pick a quiet spot. There were loads of guys in at all the spots so I snuck off to a quiet little reef ...somewhere and bagged a nice cuta of 9.5kg gutted. Not many fish came out other than a Dorado, one cuta and a snoek! (that I know of) And thats between a fair bunch of guys. So it is safe to say it is quiet. The east is pumping now and is supposed to push through the nite, lets hope it backs off so we can get in again in the morning. This weekend had some of the most increadable water we have had this year. The vis was up to 30m and as warm as 27deg. We dived insome deep water looking for some big game fish, but it was quiet out deep. There were loads of quality reef fish around, but all we wanted were big game fish. But the northern reefs were fairly quiet. All the action seemed to be between Westbrook and Umhloti. The guys diving trials got seriously side tracked with shooting Cuta and snoek on the 16m line. Gee the water was crystal clean, when we first got out at Tiffs the water was 20m! But the current started to push and the thermocline pushed in with some very cold water on the bottom. My mate saw one cuta in the distance, and thats all... it was very quiet. There is a west comming today and pushing through till Saterday, so the dive should cook this weekend. I have been hearing reports from the Shoal and Protea Banks, the guys seem to be nailing some seriously good fish. Mostly Wahoo off the Shoal ..but I dont hear any one complaining. Hoping this weekend turns on! There has been some diving around, but with mixed results. The odd fish has come out but for the most part it has been quiet. I think it might be the water temp, it is still low and generally the cuta come on once it gets to about 24 deg or more. I spoke to a commercial fisherman yesterday and he said the water was 23 deg 30km out. They had got some Wahoo and Dorries off the fads , and some good bottoms off the deep reefs ...but no cuta. check out Sea Temp watch the dark orange!! 21kg Cuta shot with a reelgun. 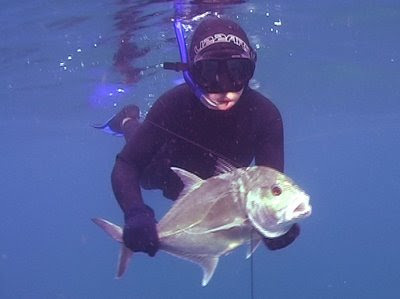 This weekend was epic for Spearfishing, the conditions were great and most spots had very good vis. The early birds seemed to get the fish and some great fish came out, including some Wahoo off Westbrook. 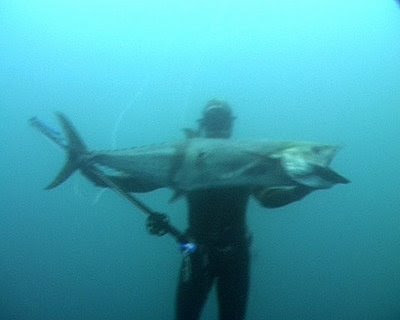 I even saw a pic of a 30kg Wahoo that was caught off a ski. 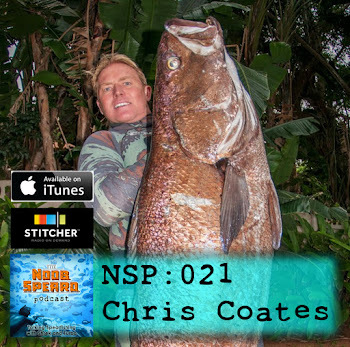 We headed north on Saturday and I got lucky with a 21kg Cuta, we thought the fish was bigger as it was long and had a huge head. But it was a bit skinny and only just made 21kg. I took my lighty for a dive on Sunday off the stairs, we dived all the way out to 4th reef. The water was very clean, but it was quiet. We dived for 3 hours with Braidy landing up shooting some reef fish on the inside. Its good to see the fish starting to come on ..... with some luck we will get some more good water and some good diving. The long term forecast is looking great for next weekend. Well the water is still clean ...for now! that is - the rivers are coming down and it might all be over by this arvo ....bleak!! The fish have been a little quiet, and only the odd fish being seen. Dont forget Salty's Club nite tonight ...... and the club shirts going cheap!! Hey I also found this article on the web .... interesting. LAHAINA - It was a fishing tournament with an environmental twist providing a $10,000 benefit for a longtime spear fisherman, Sean "Stody" Stodelle, diagnosed with an aggressive form of brain cancer. The "Roi Roundup" held Nov. 9 drew 80 divers from Maui and Oahu to waters off Lahaina. They targeted three invasive reef fish - roi, toau and taape, which were introduced to Hawaiian waters in the 1950s. The goal was to reduce the population of introduced predators as a way of protecting indigenous reef fish. The tournament was held as part of International Year of the Reef activities. Of particular concern is the roi, also known as the blue-spotted grouper, a voracious predator that grows up to 16 inches long and is estimated to eat an average of 146 fish a year. The roundup hauled in 218 roi, which tournament organizers reason saved more than 31,000 reef fish. Toau and taape, both in the snapper family, feed on young reef fish as well as compete for the crustaceans favored by reef fish such as weke and kumu. Taape, which can form large schools, have displaced other nearshore fishes more popular as food fish. The tournament was supported by the Maui County and the Office of the Mayor. Other sponsors were Maui Sporting Goods and the Hard Rock Cafe in Lahaina. "This tournament brought together many from our community who care about the health of our islands' reefs," said Mayor Charmaine Tavares. "Divers, businesses and agencies all played a role in this important event, which was one of the major highlights of this year's IYOR festivities. As more people learn about the destructive forces of invasive species on our reefs, more can be done as we work together to control them." Tournament coordinator Brian Yoshikawa of Maui Sporting Goods said the days of tournaments with no limits or regard for resource laws were over, in favor of competitions that are purposeful and nondetrimental to the reef or to the ability of future generations to harvest fish to feed their families. Darrell Tanaka, another coordinator of the fishing tournament and a lifelong fisherman, said the event's conservation twist was a novel idea. "As a spearfisher, I find this concept of killing fish to save fish rather unique," he said. "We are the only ones that have the ability to help the reefs in this way, so as divers we need to put our abilities to good use." Several state Department of Land and Natural Resources' Division of Conservation and Resources Enforcement officers from Maui were on hand to support the event as well. Enforcement officers Nalu Yen and Nathan Hillen participated in the tournament, while several others assisted with crowd control and checking in the divers with the catches. "It was a great event, and I am so pleased that our staff was willing to participate in such a worthy cause to protect our coral reefs on their day off," said Randy Awo, the division's Maui branch chief. "Our officers also wanted to be there to support Sean and encourage him to keep fighting to overcome the cancer." Stodelle, who was diagnosed with brain cancer two months ago, has become well known as a reef conservationist. 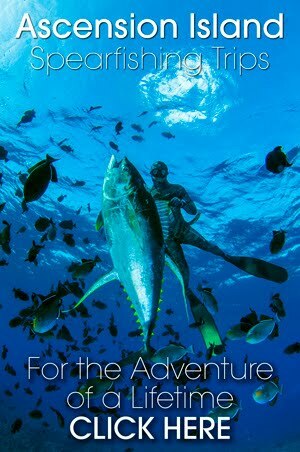 He promotes diving safety through the Hawaii Skin Diver's Web site. The Hard Rock Cafe provided support for last month's tournament by serving a continental breakfast for the divers, lunchtime entertainment by Leokane Pryor and Friends and other complimentary or discounted menu items. Dozens of businesses also donated prizes for the event. A similar invasive species fishing tournament held earlier this year also focused on roi, toau and taape and drew approximately 54 divers. Money raised during that event supported Team Hawaii, a group of three divers who represented Hawaii in the U.S. Spearfishing Championships in Rhode Island in August. The water has been real good ... just a pity the fish are so quiet. We dived Sheffield and did not see a fish. I saw 4 other divers who also saw nothing. I heard the same from a mate who dived Tiffs. But the conditions are still looking epic for the next few days...so we will keep trying!! This Friday is the Salty Divers End of Year Club Nite Jol. We will start with a good ol "Dop en Chop" ..... why change a good thing Right? The guys were amped to hit the town after ... but Saterday looks like it could seriously be on for a dive. So I think the guys might take it easy. Any way we will be there ..... maybe we will get a DVD and the big screen up? Friday afternoon had epic conditions, the water was warm, blua and the was almost no swell. I decided to take my son Braiden for a dive, and at 11years he is becoming quiet the little diver. We dived off a local point with a small reef in about 8m of water just a short distance off the backline. I was hoping to see some snoek or even a lost Garrick .... there have still been the odd one coming out. Anyway we were at the drop off and in this cave was this little Iggie, Braidy tried acouple times to get down, and into the cave. But his ears were giving him hastles and could just not get deep enough to get an angle to see the fish. So I decided to chase the fish out the cave hoping Braidy would get a shot, the fish darted out and Braidy had dived in the wrong direction missing the fish. Next thing the fish comes back to the cave, Braidy dives down before it can get inside and he nailed it! It wasn't massive but hey its an Iggie ... not sure too many 11 year olds can clame an Iggie?